Cookies and Creme Eggs. 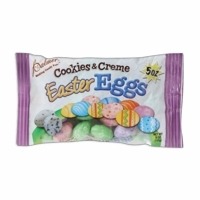 These are a white chocolate egg with chunks of cookies inside. Each egg is wrapped in a bright foil and are perfect for placing in your Easter eggs or for filling your Easter Baskets. Each bag is 5 oz. and has approx. 20 eggs.